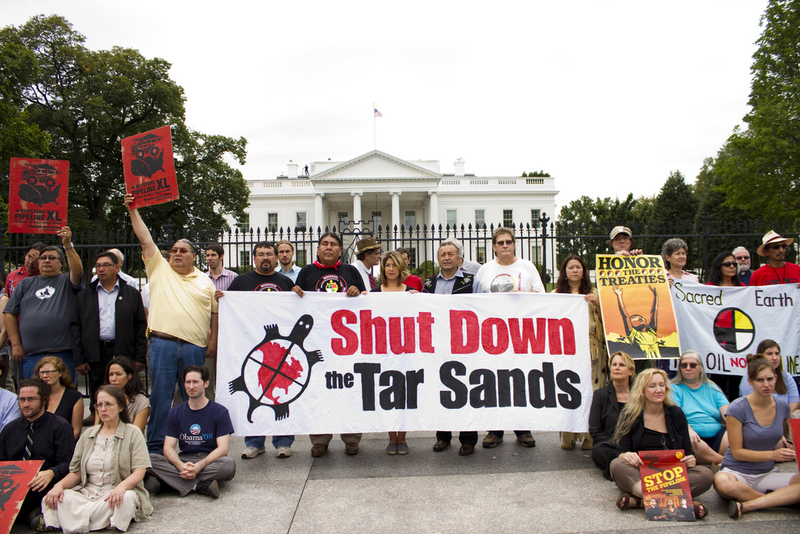 In the ongoing ﬁght to keep tarsands oil in the ground, no group has been more vocal, more consistent, and more effective than native and indigenous groups on both sides of the border. When I think back on the year's campaign -- which has at least temporarily halted construction of the pipeline -- many of the faces I see in my mind's eye come from native communities: Melina Laboucan-Massimo in tears describing the death of family and friends from the strange cancers now common across the tarsands territory, or Gitz Crazyboy showing pictures of the wrecked landscape where he grew up. The Indigenous Environmental Network, small and underfunded, was just as key in this ﬁght as the biggest of the Washington green groups. This Friday, tribal leaders from across the continent will meet for their third summit with the president in Washington, and one of the prime items on the agenda will be the ﬁght against the Keystone Pipeline. They'll talk about the way both the pipeline and the process of approving it have violated treaties, and they'll present the president with a copy of the Mother Earth Accord adopted in a special meeting at the Rosebud reservation a few weeks ago. It's a strong document, full of details about the impacts of tar sands mining and pipeline leaks and carbon emissions -- but it also speaks with the real power of the people who've lived longest and best on this continent. Indeed, it begins by afﬁrming that "the earth is our true mother, our grandmother who gives birth to us and maintains all life." In many ways, that's the most real language anyone's used in the entire debate. It sums up all the scientiﬁc testimony about parts per million and degrees of temperature rise--and it trumps all the empty nonsense about "energy security" and "pipeline jobs" that turned out, on closer examination, to be so much nonsense. Nonsense that was backed by millions upon millions in lobbying dollars, repeated in endless TV commercials, bandied about by pundits of every stripe. That nonsense may still carry the day -- the investment of the oil industry in the tarsands is so large that they will keep at it relentlessly. But at least for the moment, the Indians have carried the day. And they may be able to keep doing so. The next round of tarsands pipelines are slated to go west from the Alberta deposits to the Paciﬁc coast of British Columbia, there to be shipped via tanker to China. I was just in Vancouver and met all sorts of people organizing to block those pipelines too -- and many of their leaders were from the native communities too. Along the Canadian coast many tribes never even signed treaties, and Canadian courts have granted them great power over their land -- enough power that they seem conﬁdent of victory. No win lasts forever, not in environmental battles. There's always someone there who wants the money badly enough that they'll ﬁnd a way; no one has longer and more painful experience with that reality than native peoples across this continent. But on Friday native leaders will be representing their sovereign nations with full pride in the fact that they helped face down the oil industry, at least for a while. It's a last-ditch battle; but maybe, just maybe, it's the kind of ﬁght that can help turn the tide. Top 10 Illegally Shared Movies of 2011 ! First chapter of more than 85,000 books free !! 1,000 Years of History !! Your Facebook profile could get you fired ! Pllop Showcase (new way to show your products) !! Merry Christmas / Happy New Year !! Why Should We Care About Mexico? House Resolution concerning "World Peace Prize"
Ontario polar bears doomed, expert says ! !